Capitol Center for Oral & Maxillofacial Surgery offers implant services in Concord and Peterborough, NH. To schedule an appointment call 603-225-0008 (Concord) or 603-784-5447 (Peterborough). 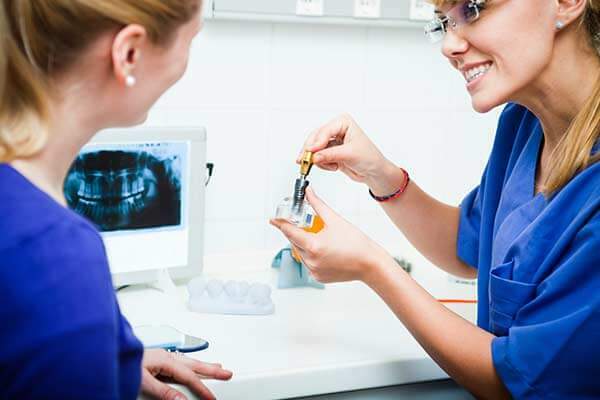 Dental implants have become the gold standard to replace missing or failing teeth. Despite popular myths, they are not prone to failure. In fact, the American Academy of Oral and Maxillofacial Surgeons (AAOMS) states that, when placed by a specialist, dental implants have a success rate of 95%. 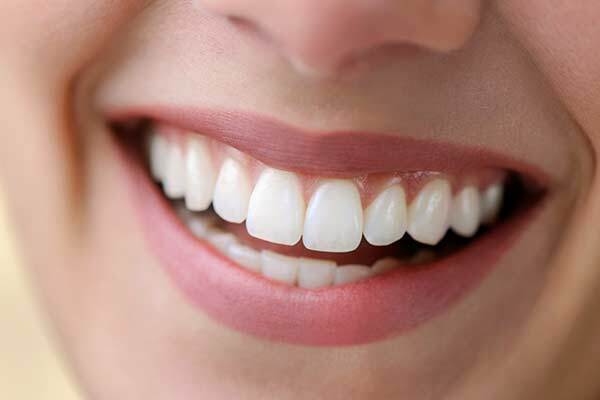 A beautiful smile and the confidence that it brings are certainly important, but did you know that dental implants also carry significant oral health benefits? Whether you are replacing one tooth or many teeth, dental implants preserve jawbone. When a tooth is missing, the body natural resorbs the jawbone over time. This can compromise the stability of neighboring teeth and lead to the sunken appearance that is a hallmark of denture wearers. It also causes dentures to gradually lose their fit, requiring periodic relines. Dental implants replace missing teeth, halting and even reversing the process of jawbone loss. They provide a fuller, more youthful appearance, and they protect the integrity of the surrounding teeth. Dental implants provide a strong, stable base for high quality replacement teeth, restoring nearly all of the original bite strength. While they are costlier up front than other solutions such as bridges or dentures, dental implants become the least expensive solution over a lifetime ad they do not compromise healthy teeth or bone as bridges and dentures do. 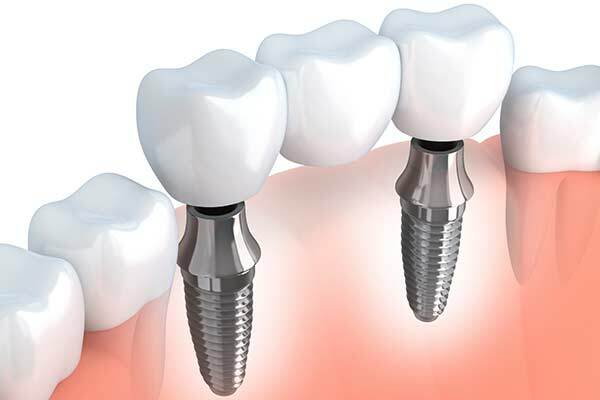 Made from biocompatible titanium, one dental implant can support a single crown. The implant is placed in the jawbone and allowed to fuse with the bone for several months. 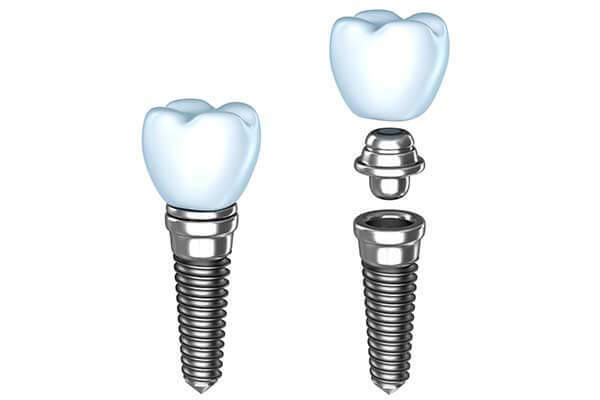 When this osseointegration is complete, an abutment post is used to permanently attach the crown to the implant. If you are missing three or more teeth in a row, an implant supported bridge may be right for you. While a traditional dental bridge requires the natural teeth at each end to be shaved down and prepared to receive crowns, an implant supported bridge is anchored to an implant at each end. This leaves the adjacent teeth undisturbed, reducing the risk for future damage or decay. Implant supported dentures can be either fixed or removable. 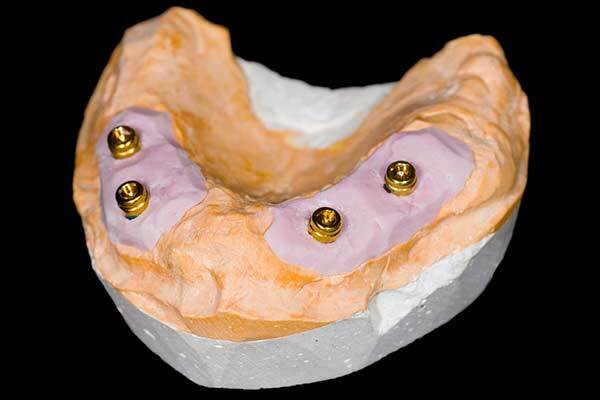 Just two implants can stabilize an existing removable denture, eliminating the need for pastes or adhesives. A handful of dental implants can support an entire fixed upper or lower arch of teeth that never leave your mouth. This unique solution uses 4 immediate-load dental implants to secure a full, fixed arch of teeth. Rather than waiting for months for traditional dental implants to osseointegrate with the jawbone, you can receive your new, fixed arch of teeth on the same day that your implants are placed. There is no plastic palate on the roof of your mouth, as with traditional dentures, making speaking and eating more natural and more comfortable. Using CBCT scans and restorative virtual treatment planning, along with our specialized training, we are able to provide guided implant placement for our patients. We create a digital 3-D model of each patient’s unique oral anatomy, allowing us to design an individualized treatment plan that optimizes the aesthetics, function, and longevity of the final restoration. We then use specialized software to create a precise surgical guide to use during implant placement. This guide directs the exact location, angle and depth of the implant placement. Using this surgical guide increases the safety, accuracy, efficiency, and predictability of implant surgery. If you would like to be evaluated for dental implants and are in Concord or Peterborough, we invite you to schedule a consultation. Call our office at 603-225-0008 (Concord) or 603-784-5447 (Peterborough) today.